Most assuredly you have heard someone say this or read something along this line in a golf article. What exactly does “trust in your swing” mean and why is trust so important in golf? Trust is simply relying on your muscle memory to hit a golf shot and not over controlling it. For example, trust is when you are standing over a three-foot putt, and you just tap it in without no thought of stroke. The thing that challenges your trust is the circumstances you are experiencing. 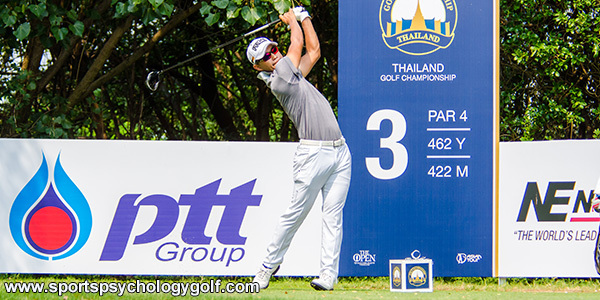 A three-foot putt in practice is one thing… but a three-foot putt in a tournament against a rival on bumpy greens for par to take over the lead can really challenge your belief to sink that putt. Trust is important because it allows you to perform freely in a relaxed body and an uncluttered mind. When you lack trust, you set in motion a series of circumstances that increase the level of difficulty to a higher degree. Notice how the following analogy illustrates how a lack of trust can have an intense impact on the belief in your ability to do something that you have already trained your body to do. You don’t pay the sign any mind, after all, no one is on the road, you are not speeding by any means and you have driven over countless bridges in your lifetime. As you approach the bridge, you see it is an old wooden one-lane bridge. You pump the brakes and nervously proceed, crawling across the bridge. You swear you hear the bridge creek with every turn of your tires. You even internally question the integrity of the bridge and wonder how it is still standing. As you are driving over the bridge, you can feel yourself grip the steering wheel tighter and think of every possible peril that could happen. When you finally make it across, you feel relieved but that bridge experience left an imprint on your mind for the next several miles. A lack of trust in golf is quite similar to this bridge driving experience. Your muscles tighten… You swing tentatively… You worry about missing… even if it’s only a three-foot putt! Trust is that thing that pushes your game to the next level, just like it did for Brandt Snedeker, winner of the 2018 Wyndham Championship. Snedeker had an amazing first round shooting a 59, 1 shot shy of matching the PGA Tour record. Snedeker made a 20-foot putt on his final hole of the first round to become the ninth player in tour history to break 60. How was Snedeker able to perform at such a high level? Well, Snedeker’s historic round was a matter of trust, just immersing himself in the moment and doing what he trained his mind and body to do. Snedeker stayed present, trusted in his abilities and kept his mindset positive instead of focusing on the intense pressure of the situation. Trust in your skills is the glue that pieces your game together, keeps things ‘clicking’ and paves the way for peak play. Focus on your execution of the shot instead of the trouble awaiting. The bridge analogy illustrates the importance of focusing on what you are doing and not the conditions around you. 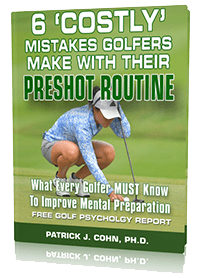 Take a free practice swing and rehearse the shot in your mind. Keep it simple. 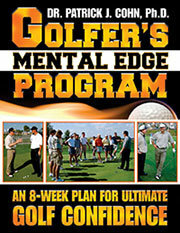 Focus on one swing trigger only, such as target or tempo, and leave the self-coaching for the practice range or green.